Chinese Fans Are Slow To Warm Up To Ice Hockey : Parallels After China won its bid to host the 2022 Olympics, President Xi Jinping vowed to encourage winter sports. But so far, the country's first professional hockey club has struggled to find fans. 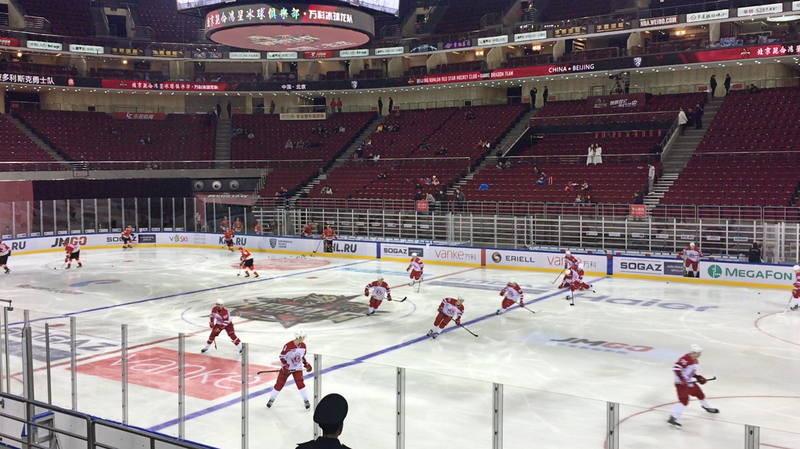 The Kunlun Red Stars, China's hockey team, warm up before a game. As the Beijing Kunlun Red Stars hit the ice to face off against a team from Moscow, tension is high. A win tonight is crucial to make it to the playoffs in the Kontinental Hockey League, or KHL, Russia's top professional hockey league, second only to the U.S. National Hockey League in talent. But hardly anyone in the 15,000-seat Beijing arena understands the stakes. In fact, there's hardly anyone here; a vast majority of the seats are empty. 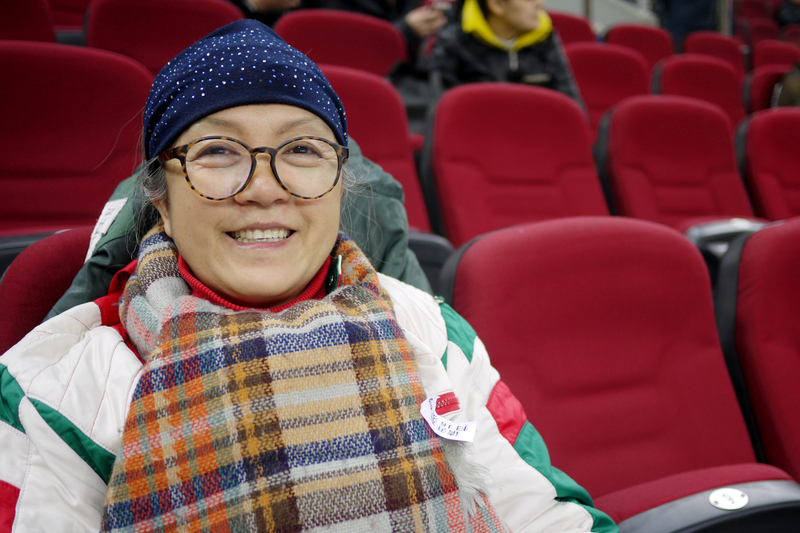 Zhang Cuihua, 60, came to watch the Kunlun Red Stars after receiving a free ticket. "China's no good at hockey," she says. Zhang Cuihua, a 60-year old granny, takes up three seats with bags of knitting supplies. Someone gave her free tickets, and she figured a hockey game was a good excuse as any to knit a sweater. "I tried to get my son's family to come with me, but they weren't interested. I haven't seen a hockey game in 20 years — I forget the rules. I can't figure it out. One team is Russian, but who's the other team?" she asks me. That's your Beijing team, I tell her. She looks up from her knitting and squints through oversized spectacles. "Oh. But they're all foreigners! China's no good at hockey," she concludes, returning to her knitting. China's team has 18 players from Russia, Finland, Canada and the United States. There are a few Chinese nationals, but none of them can compete at this level and they rarely see ice time. Team CEO Emma Liao says sponsors, many with close connections to China's government, have already covered the $30 million cost needed to run the Red Stars. Now comes the hard part: educating the public about the team — and about hockey, for that matter. "Nobody really knows what is hockey," Liao says with a sigh. "So our job is to educate the audience [about] what is hockey, why it's so attractive and why they should come to watch the hockey game." 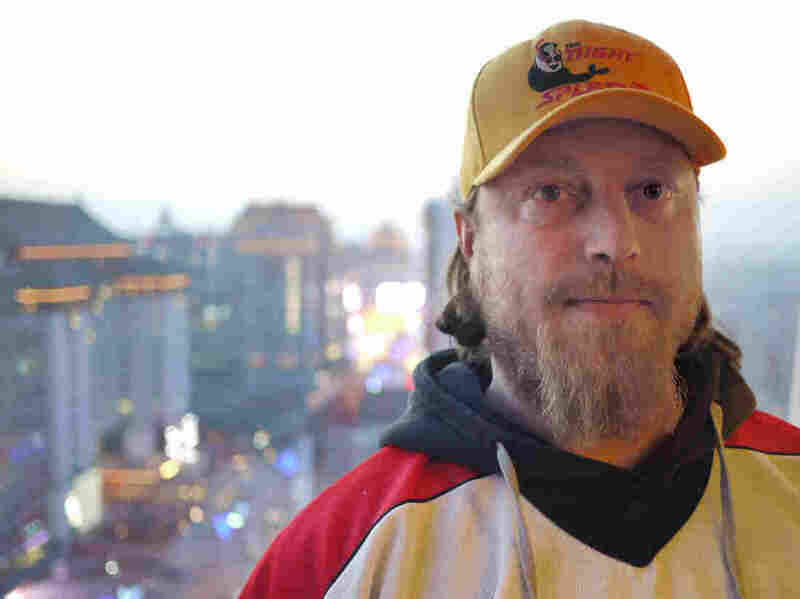 Few people have done this more than Mark Simon, a Canadian hockey coach who's worked for years to raise awareness about the sport in China and now volunteers as an assistant for the Red Stars. On this particular day, he's juggling an order for new jerseys with a hospital visit to the team's goalie, who's out with an injury. Mark Simon, a Canadian hockey coach, now volunteers as an assistant for the Red Stars. Simon says he wasn't sure what to think when he first heard about the team. "Great idea — KHL. China, Russia, you know, the Communist brothers and all the stuff. I mean, I get it," he says. "But I still thought, you know, it's early. To expect that you're going to fill an NHL-sized rink is insane." Simon says the Red Stars have already broken a KHL record for lowest attendance at a single game — 550 people. The sparse crowds can make for an awkward game-day experience, when the team's 12-member cheerleading squad's cheers are swallowed by the void of a near-empty arena. Or when the announcer – who Simon complains doesn't know a thing about hockey – begins an exuberant cheer for the Red Stars two seconds after the opposing team scores. A group of spectators from Finland is amused, and a little confused. They say the game would be better if they were drunk. But tight security rules prohibit alcohol inside the arena. They're the only audience members I meet who've actually bought tickets. Peter Solonen, one of the Finns, says he's never seen a hockey game with such good talent attract so few fans. "They've still got something to learn," he says with a laugh. "You don't see hockey anywhere else but inside the stadium. Nowhere else. That is weird." It may be weird, but for Red Stars player Zach Yuen, it's a dream come true. He was the first Chinese-Canadian defenseman drafted by the NHL, and he's chosen to come here now, to play in his homeland. "When I was growing up, I never had a role model," says Yuen. "It would've been cool to have a role model to look up to. Just to know that it's possible. Because the entry to hockey is tough for sure, culturally. In China, there are kids that watch our games and hopefully, I can live up to that and be a role model for them." Kids like Yuan Zhongfan, who's practicing with his team in Shanghai, could use a role model. The eight-year-old loves hockey, but he's not sure how supportive his parents will be when he gets older. "My mom wanted me to learn swimming, but I wasn't tall enough. There was a hockey rink nearby, so we picked that," he says. Yuan says his dream is to play for the Chicago Blackhawks. I ask him what his parents think about this. "They don't think it's possible," he says, "because no Chinese player has made it to the NHL." Yuan's parents have never heard of Zach Yuen, and they don't know much about the Red Stars — who, as it happens, lost their big game and have likely lost their chance to make it to the playoffs. But China's government is dreaming big about hockey. And no matter how obscure the sport is today, if he works hard, this eight-year-old from Shanghai may someday get a shot at his dream, too.